Aspen Exterior is an exterior remodeling company specializing in furnishing and installing the finest quality windows, doors, siding, and roofs. Since 1978, we have grown from our first truck to our current 17,000 sq. ft. Design Center, warehouse, and production facility. At Aspen, we focus on the complete experience — starting with the initial contact, through the design phase and choosing of materials, to ordering all the components, scheduling of craftsmen, and ending with a completed custom installation. The majority of our projects are with prior customers and their direct referrals. Over the decades, we have created a large family of customers who appreciate quality products and craftsmanship because it’s their home. Aspen opened in 1978 doing aluminum siding and then expanded into windows, doors, skylights, bays, cedar siding, fiber cement siding, composite siding, roofing, gutters, and custom design elements such as columns, porticos, stone work, and crown moldings. Aspen has grown from a small room above a real estate building in Barrington to the current 17,000 sq. ft. Design Center, warehouse, and production facility. Remodeling can be a daunting and stressful endeavor. At Aspen Exterior, we focus on creating a pleasant experience from the initial contact to a beautiful completed project. The process begins by visiting our design center, or by calling or emailing for an appointment to have one of our designers visit your home. A designer will discuss your goals and present different options and types of materials that could be used to create your dream results. Your designer will take detailed measurements and digital photos of your home, which will be used to start the estimating process. Once that is completed, another visit to our design center is usually in order to review the project and decide details such as colors, finishes, sizes, and options. After the project is ordered, materials lists and craftsmen work orders are created, and products are ordered. When the products have all arrived, our production coordinator is in contact with the customer to schedule a day for our team to begin the project. At Aspen, we work consecutive days, weather permitting, until each specific phase of the project is complete. Many different crews may need to be coordinated to complete a multi-layered project. Work sites are kept clean, and all debris is hauled away daily. Our craftsmen work with you to answer any questions that you might have. After all the details are completed, another customer has joined the family of those who wanted the best: an Aspen Exterior. Why Choose Aspen Exterior Company? 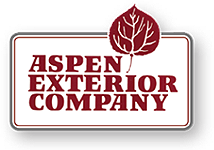 Aspen Exterior Company is a premier exterior remodeling company with specialties in windows, doors, siding, and roofing installations. At Aspen, we have more than 36 years of experience working in residential homes in the Chicagoland area. Many of our craftsmen have been with us for decades, giving us consistent, high-quality custom installations. Our designers spend the time to design and present different alternatives to our projects in a consulting process. Our Aspen Exterior showroom has materials on display to help visualize a completed project. Our complete showroom, warehouse, and production facility are under one roof. Our production coordinator’s responsibility is to coordinate the material and labor flow for each project. Our field superintendent supervises and oversees the projects. 67% of our projects are from prior customers and their direct referrals. Aspen gives you a 10-year warranty on labor and is licensed and bonded. Aspen is a Mastic Elite Contractor, CertainTeed 5-Star Contractor & Master Shingle Applicator, and VSI Certified Installer. Aspen is Better Business Bureau A+ rated and has years of complaint-free awards. Angie’s List has awarded Aspen their Super Service Award, which goes to only the top 5% of each category. Aspen has consistently won the Daily Herald Reader’s Choice Award. All this means we will do an excellent job for you from the start to the completion of the job.